Bobsled iPad | Android | Blackberry | iPod Touch | iPhone Free Calls | Free Pc to Phone Calls, Free Voip Calls to India International ! Few months back we posted about Bobsled T Mobile voip service. Bobsled started as a competition to the voip giant Skype and it has now proved so. It was initially more of a facebook calling app, where people were using Bobsled facebook app for making calls to other facebook friends. However bobsled apps for browser, PC, iPhone, Android mobiles soon took over and large number of people started using them for making free calls to USA and Canada. In this post we will see the features of Bobsled Smartphone apps, and how bobsled can be used on these smartphones for free calls. Bobsled is an application available for PC, iPhone, iPod touch, iPad, Android Mobiles, Blackberry. It uses your internet connection and can be used to make free calls. Bobsled users can easily message or call for free across devices, countries, social networks, operating system - and all mobile carriers. Bobsled is a new way to communicate, centered around your social circle. It is one-touch calls with or without phone numbers. Simply tap on a friend to call them. Bobsled will find them on Facebook or their iPhone/iPad/iPod Touch/Android/Blackberry, and connect the call. If they are not there, send chat messages right from the app. Always stay connected with your friends. 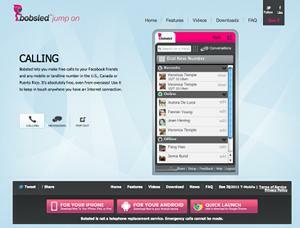 Your friends can reach you anywhere with Bobsled, in your browser or on your phone or tablet. Bobsled is really getting popular these days! The simple reason it is centered around social circle and combines the two most used means to communicate : Pc and Mobiles! Bobsled has now expanded messaging and enhanced calling functionality for Bobsled™ by T-Mobile, providing consumers with effortless communication for free across devices, countries, social networks and mobile carriers. With Bobsled, now people can not only make free voice calls from an iPad or tablet, but can also send free one-to-one and group messages anywhere in the world, and access their phone’s contacts and text messages from their tablet or computer. You can now send send free, rich media messages including photos, videos and locations to Bobsled users anywhere in the world where they have an open data connection from any Android-powered smartphone, tablet or Web-connected device, using their existing mobile number. Bobsled is available for iOS devices. However it requires facebook login to use bobsled. Expect great things in future releases, including video calling, inbound calls from any phones, login with email, Honeycomb app, and much more! Data rates may apply. Calls to landline and mobile phones are currently limited to 75 minutes/call. Not yet launched. Will be launched soon. Keep checking for latest update on this.